Perfumers love Marcel Proust. 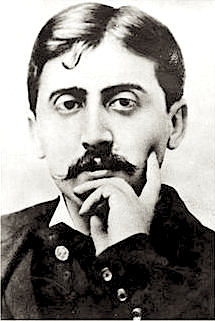 The “episode of the madeleine” is the most famous passage from his multi-volume masterpiece, “À la recherche du temps perdu” (In Search of Lost Time), a book Proust began writing in 1909 until 1922 when he passed away from pneumonia. In one of the first volumes of the novel, he describes an experience eating a small cake called a madeleine, dipped in tea, and the involuntary rush of memories that ensue about his childhood spent in Combray, and the whole cast of artistocrats, lovers, writers and places that figured into the narrator’s journey through life in France in the late 19th century. Many interpret “In Search of Lost Time” as a treatise on art and its ability to triumph over the destruction of time. For perfumers, this passage articulates precisely what makes perfume so compelling–its effect on the unconscious mind. Here is the famous passage excerpted, best read with a cup of tea and a cookie. I feel that there is much to be said for the Celtic belief that the souls of those whom we have lost are held captive in some inferior being, in an animal, in a plant, in some inanimate object, and so effectively lost to us until the day (which to many never comes) when we happen to pass by the tree or to obtain possession of the object which forms their prison. Then they start and tremble, they call us by our name, and as soon as we have recognised their voice the spell is broken. We have delivered them: they have overcome death and return to share our life. And so it is with our own past. It is a labour in vain to attempt to recapture it: all the efforts of our intellect must prove futile. The past is hidden somewhere outside the realm, beyond the reach of intellect, in some material object (in the sensation which that material object will give us) which we do not suspect. And as for that object, it depends on chance whether we come upon it or not before we ourselves must die. Many years had elapsed during which nothing of Combray, save what was comprised in the theatre and the drama of my going to bed there, had any existence for me, when one day in winter, as I came home, my mother, seeing that I was cold, offered me some tea, a thing I did not ordinarily take. I declined at first, and then, for no particular reason, changed my mind. She sent out for one of those short, plump little cakes called ‘petites madeleines,’ which look as though they had been moulded in the fluted scallop of a pilgrim’s shell. And soon, mechanically, weary after a dull day with the prospect of a depressing morrow, I raised to my lips a spoonful of the tea in which I had soaked a morsel of the cake. No sooner had the warm liquid, and the crumbs with it, touched my palate, a shudder ran through my whole body, and I stopped, intent upon the extraordinary changes that were taking place. An exquisite pleasure had invaded my senses, but individual, detached, with no suggestion of its origin. And at once the vicissitudes of life had become indifferent to me, its disasters innocuous, its brevity illusory–this new sensation having had on me the effect which love has of filling me with a precious essence; or rather this essence was not in me, it was myself. I had ceased now to feel mediocre, accidental, mortal. Whence could it have come to me, this all-powerful joy? I was conscious that it was connected with the taste of tea and cake, but that it infinitely transcended those savours, could not, indeed, be of the same nature as theirs. Whence did it come? What did it signify? How could I seize upon and define it? I drink a second mouthful, in which I find nothing more than in the first, a third, which gives me rather less than the second. It is time to stop; the potion is losing its magic. It is plain that the object of my quest, the truth, lies not in the cup but in myself. The tea has called up in me, but does not itself understand, and can only repeat indefinitely with a gradual loss of strength, the same testimony; which I, too, cannot interpret, though I hope at least to be able to call upon the tea for it again and to find it there presently, intact and at my disposal, for my final enlightenment. I put down my cup and examine my own mind. It is for it to discover the truth. But how? What an abyss of uncertainty whenever the mind feels that some part of it has strayed beyond its own borders; when it, the seeker, is at once the dark region through which it must go seeking, where all its equipment will avail it nothing. Seek? More than that: create. It is face to face with something which does not so far exist, to which it alone can give reality and substance, which it alone can bring into the light of day. And I begin again to ask myself what it could have been, this unremembered state which brought with it no logical proof of its existence, but only the sense that it was a happy, that it was a real state in whose presence other states of consciousness melted and vanished. I decide to attempt to make it reappear. I retrace my thoughts to the moment at which I drank the first spoonful of tea. I find again the same state, illumined by no fresh light. I compel my mind to make one further effort, to follow and recapture once again the fleeting sensation. And that nothing may interrupt it in its course I shut out every obstacle, every extraneous idea, I stop my ears and inhibit all attention to the sounds which come from the next room. And then, feeling that my mind is growing fatigued without having any success to report, I compel it for a change to enjoy that distraction which I have just denied it, to think of other things, to rest and refresh itself before the supreme attempt. And then for the second time I clear an empty space in front of it. I place in position before my mind’s eye the still recent taste of that first mouthful, and I feel something start within me, something that leaves its resting-place and attempts to rise, something that has been embedded like an anchor at a great depth; I do not know yet what it is, but I can feel it mounting slowly; I can measure the resistance, I can hear the echo of great spaces traversed. Undoubtedly what is thus palpitating in the depths of my being must be the image, the visual memory which, being linked to that taste, has tried to follow it into my conscious mind. But its struggles are too far off, too much confused; scarcely can I perceive the colourless reflection in which are blended the uncapturable whirling medley of radiant hues, and I cannot distinguish its form, cannot invite it, as the one possible interpreter, to translate to me the evidence of its contemporary, its inseparable paramour, the taste of cake soaked in tea; cannot ask it to inform me what special circumstance is in question, of what period in my past life. Will it ultimately reach the clear surface of my consciousness, this memory, this old, dead moment which the magnetism of an identical moment has travelled so far to importune, to disturb, to raise up out of the very depths of my being? I cannot tell. Now that I feel nothing, it has stopped, has perhaps gone down again into its darkness, from which who can say whether it will ever rise? Ten times over I must essay the task, must lean down over the abyss. And each time the natural laziness which deters us from every difficult enterprise, every work of importance, has urged me to leave the thing alone, to drink my tea and to think merely of the worries of to-day and of my hopes for to-morrow, which let themselves be pondered over without effort or distress of mind. And suddenly the memory returns. The taste was that of the little crumb of madeleine which on Sunday mornings at Combray (because on those mornings I did not go out before church-time), when I went to say good day to her in her bedroom, my aunt Léonie used to give me, dipping it first in her own cup of real or of lime-flower tea. The sight of the little madeleine had recalled nothing to my mind before I tasted it; perhaps because I had so often seen such things in the interval, without tasting them, on the trays in pastry-cooks’ windows, that their image had dissociated itself from those Combray days to take its place among others more recent; perhaps because of those memories, so long abandoned and put out of mind, nothing now survived, everything was scattered; the forms of things, including that of the little scallop-shell of pastry, so richly sensual under its severe, religious folds, were either obliterated or had been so long dormant as to have lost the power of expansion which would have allowed them to resume their place in my consciousness. But when from a long-distant past nothing subsists, after the people are dead, after the things are broken and scattered, still, alone, more fragile, but with more vitality, more unsubstantial, more persistent, more faithful, the smell and taste of things remain poised a long time, like souls, ready to remind us, waiting and hoping for their moment, amid the ruins of all the rest; and bear unfaltering, in the tiny and almost impalpable drop of their essence, the vast structure of recollection. And once I had recognized the taste of the crumb of madeleine soaked in her decoction of lime-flowers which my aunt used to give me (although I did not yet know and must long postpone the discovery of why this memory made me so happy) immediately the old grey house upon the street, where her room was, rose up like the scenery of a theatre to attach itself to the little pavilion, opening on to the garden, which had been built out behind it for my parents (the isolated panel which until that moment had been all that I could see); and with the house the town, from morning to night and in all weathers, the Square where I was sent before luncheon, the streets along which I used to run errands, the country roads we took when it was fine. And just as the Japanese amuse themselves by filling a porcelain bowl with water and steeping in it little crumbs of paper which until then are without character or form, but, the moment they become wet, stretch themselves and bend, take on colour and distinctive shape, become flowers or houses or people, permanent and recognisable, so in that moment all the flowers in our garden and in M. Swann’s park, and the water-lilies on the Vivonne and the good folk of the village and their little dwellings and the parish church and the whole of Combray and of its surroundings, taking their proper shapes and growing solid, sprang into being, town and gardens alike, all from my cup of tea. 3 Responses to "And suddenly the memory returns: Marcel Proust"
In Search of Lost Time is one of my all time favorite works of literature. I can’t say I have read every volume, but I’m pretty darned close! There are so many cultural references to perfume. I didn’t want my blog to be merely another review. The history is rich and you are right, there is a lot to be discovered! Thanks so much for the comment. Have a nice weekend!